A DIGITAL MARKETING AGENCY SPECIALIZING IN VIDEO PRODUCTION, WEBSITE DESIGN, MOBILE APP DEVELOPMENT, PHOTOGRAPHY, AUDIO & VOICE OVER TALENT. TV commercials, corporate & product videos, training videos or video marketing campaigns. Our production team has years of experience creating high impact videos and motion graphics. Our website designers and developers specialize in mobile optimization, custom CMS development, e-commerce, SEO and social integration. We can even help with domains, SSL, hosting and more! Mobile apps keep you connected with your audience. We develop high quality mobile apps for Android & iOS. From design to app store submission our developers have you covered. From business cards to brochures, vinyl banners or print advertising our graphic designers will create collateral that demands attention. We even provide affordable, high quality printing services. Our award-winning audio production team specializes in radio ads, on-hold system voicing and more! We can help you find the perfect voice over talent for any delivery style or language. We have the knowledge to break down those confusing ratings numbers and can negotiate the best deal for you. Best of all, you won’t have to deal with countless media sales people… allowing you do what you do best! 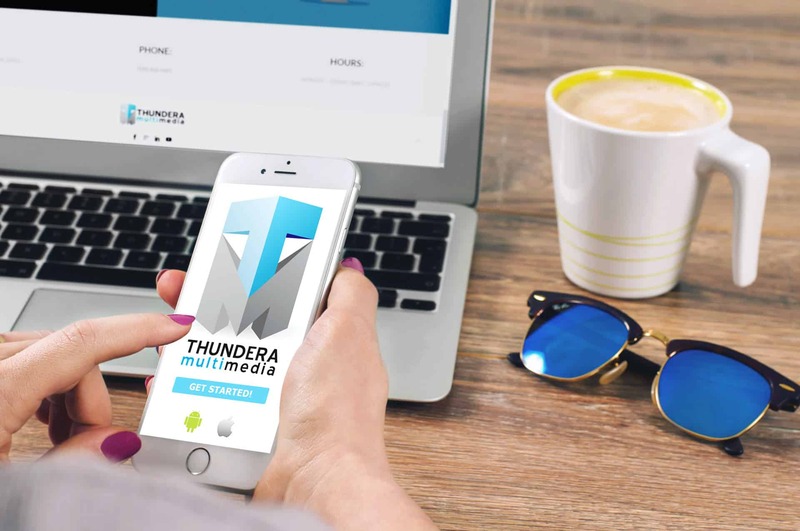 Thundera Multimedia is an innovative marketing and digital production company committed to converting our clients' visions into successful business realities. Through strategic planning and precise target definition, our award-winning creative team will work with you to design marketing collateral to achieve your business objectives. Our designers and developers will stay focused on your audience and brand identity whether we are building your company a new website, producing an online video marketing campaign or developing a mobile app for your organization. Our objective is to help you find the most efficient, cost effective way to engage your audience and grow your customer base. THINKING ABOUT A NEW WEBSITE? SEE WHAT OUR DESIGNERS CAN DO FOR YOU!